Live in Mira Mesa, CA and searching for a drain clean out service company? Live in San Diego, CA and searching for a Slab Leaks repair service company? We can handle your plumbing emergency including Slab Leaks problem! Find the best plumber in Poway CA! 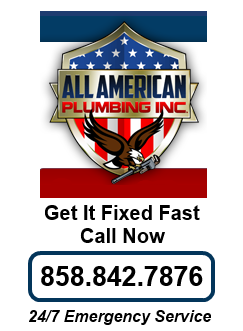 All American Plumbing INC employ the best plumbing contractors in Poway. At All American Plumbing we have one rule and that is that we only hire the best plumbers and plumbing contractors that we can find! This way we can trust our staff to deliver the highest quality of plumbing service in the business. How do you find the best plumbers? A common question is how do you know when you have found the best plumbers – well, at All American Plumbing INC we have a very diligent hiring process. By being picky about who we hire we can make sure that the individuals who are employed with us are part of the top 1% of plumbers located in the Poway area. In order to be part of the All American Plumbing team our employees must meet specific training qualifications. They must all be full safety certified and dedicated to delivering honest, reliable and trustworthy. Our high standards are one of the reasons why we are one of the best know plumbing contractors in Poway We are one of the most sought after plumbing trade employers because we pay our staff well and take care of our staff so that we know they will work well for us! Another reason why we are so popular as a plumbing contractor in Poway is because we are always on call and we do not charge extra for weekend services. The reason for this is because plumbing disasters don’t wait until you are ready. In the field of plumbing a problem can come up at any minute and we want to be available to help our customers out. Along with providing regular business hours All American Plumbers are always on call for these occasional plumbing emergencies. Give us a call (night or day) and we will be at your door to take care of it. Whether it is a large leak, full on flood or a broken gas line we will get there quickly and make the repair a top priority. We don’t want your plumbing emergency to become a full-on disaster and we know when a fast respond is necessary. If you are looking for the best plumbers in California who respond to your call fast – contact All American Plumbing Contractors today! Or visit: plumbing-sandiego.net for more info.